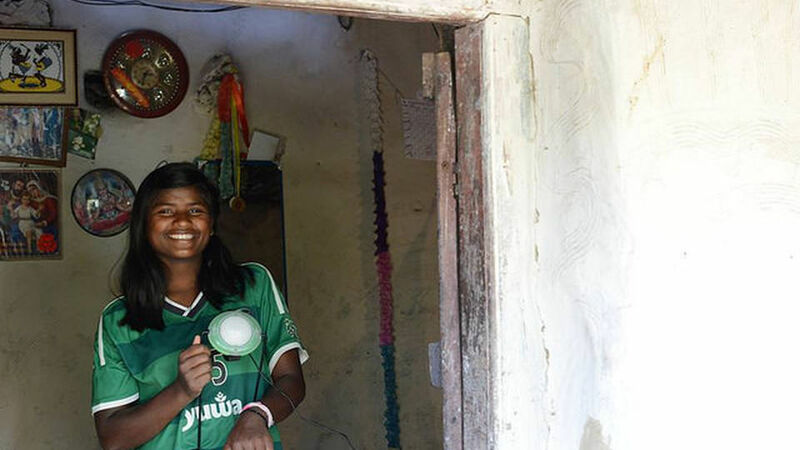 Solar lanterns and solar home systems are helping off-grid homes across the developing world access electricity for the first time, transforming lives and offering a window on the world. The amount of electricity provided by solar home systems and lamps is surprisingly small: the 20 Wp module supplies about 50 watt-hours (0.05 kWh) per day, and the cell on a small lamp only about one watt-hour (0.001 kWh). However, the benefits can be huge. The main use of a solar home system is to provide better lighting. Many homes without access to grid electricity use kerosene lamps, which are dangerous, producing health-damaging fumes and a constant risk of fires. 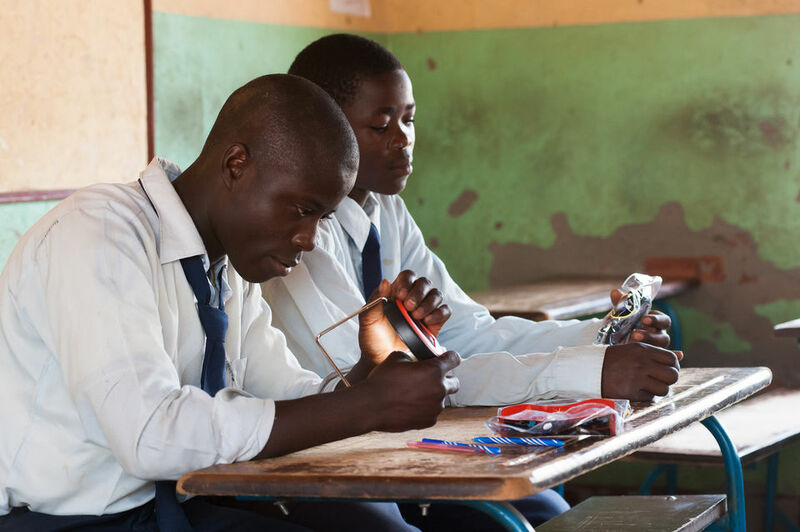 Children are particularly at risk, so Ashden winner SolarAid has focused on selling solar study lamps, which can be used on a table for homework. Even these smallest solar lamps give more light than a kerosene lamp. And it’s not just studying that is easier and safer with better light. Housework is faster, midwives can deliver babies more safely, shopkeepers can display goods, cattle can be tended and farm produce sorted and packed. Mobile phones keep people in touch with family and friends, and give access to information, entertainment and mobile money. 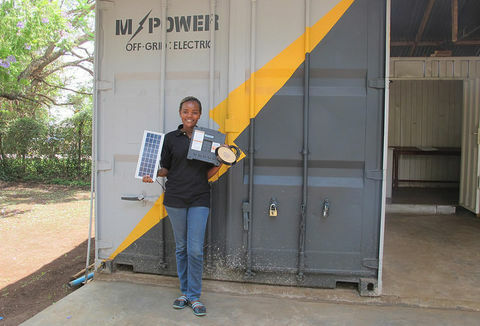 Being able to charge a mobile phone at home with solar power enables people in off-grid homes to stay connected to the world, without the cost and effort of sending phones to be charged in town. Solar systems can also power radios, providing entertainment and information, and larger systems run TVs as well. Costs of solar home systems and lamps vary between countries, and have come down rapidly over the past ten years. In 2014, you’d pay about US $140 to buy a 20 Wp Barefoot Power kit including five LED lights and a phone charger in East Africa, or to have a 20 Wp system with three lights and phone charger installed on your home by Grameen Shakti in Bangladesh. Even though many families spend more than US$150 on kerosene and phone charging in a year, it is a large amount to pay in one go, and the upfront cost can be prohibitive. 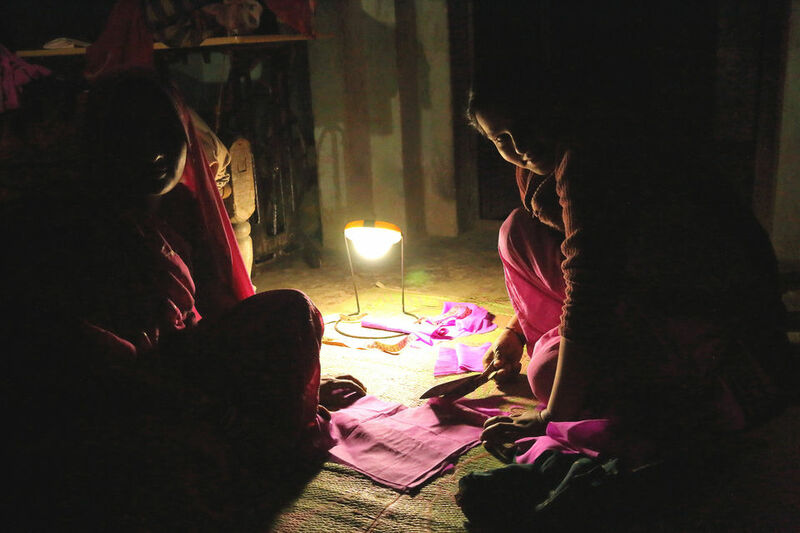 In South Asia, microfinance has been used successfully for many years to make solar home systems affordable. 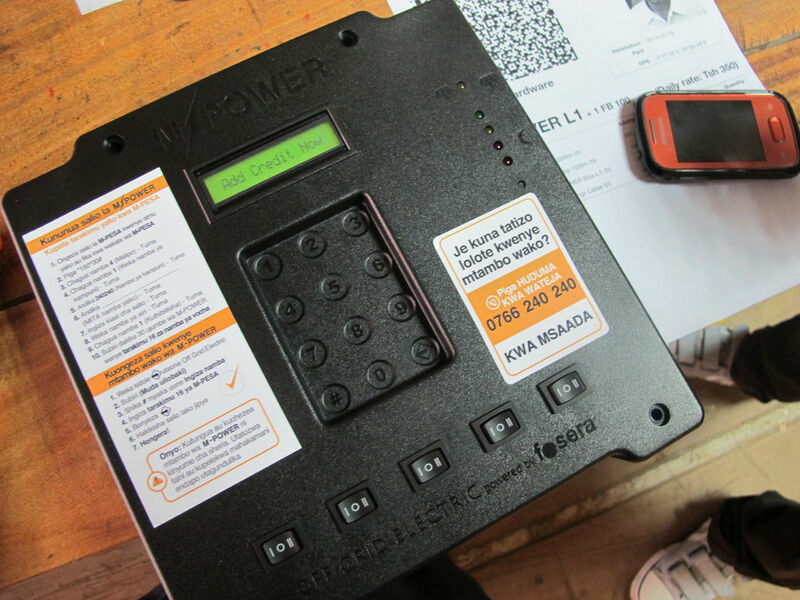 More recently there has been a fast-growing amount of businesses providing systems on a ‘pay-as-you-go’ basis, like Off Grid Electric in Tanzania encouraging customers to pay with their mobile phones. Solar home systems and lamps use photovoltaic (PV) cells and rechargeable batteries to provide electrical power away from the mains grid. Lamps provide a single light (and sometimes phone charging) and are portable. Solar home systems are fixed in a home and can supply several lights, phone charging and other small appliances. PV cells are made from semiconductor materials, such as silicon, and generate dc electricity from sunlight. A number of cells can be connected together and sealed in a weatherproof casing to form a PV module. PV cells and modules are specified by their ‘watt-peak’ (Wp) rating, which is the power generated under standard conditions, equivalent to bright sun in the tropics (they still work at lower light levels). The rechargeable batteries store electricity so that it is available at night and on cloudy days, as well as when the sun is bright, and they also provide a stable voltage for the appliances that use the electricity. Lithium-ion batteries are rapidly becoming the most popular because, with good electronic controllers, they last longer. The PV module of a solar home system should be fixed in a position that collects as much sunlight as possible, ideally on an unshaded roof – this also reduces the risk of theft. The battery is kept indoors with the terminals covered so that they cannot accidentally be touched. The PV, battery, lights and sockets for appliances are wired to the charge-controller. Customers usually buy solar systems based on the service that they provide (for example: ‘charge one phone and run two lights for six hours each day’). In a solar lamp, the LED light, battery and charge controller are all in a casing which is easy to carry and can stand on a table, or hang from the ceiling. Solar-home-systems and lamps can be very reliable and need little maintenance, although in many countries there are cheap, poor quality products on the market as well. Users must be trained to check the battery, keep the PV module clean and make sure that connectors are secure. Even with careful use, batteries eventually deteriorate and need to be replaced, though modern lithium batteries are much more durable than the traditional lead acid batteries. 1.2 billion people in the world don’t have access to electricity, most of them in low income countries. For example, in Tanzania less than 15% of the population are connected to the mains electric grid. Even in India, where three quarters of the population have grid power within reach, the supply is unreliable with frequent and lengthy power cuts in many places. Solar home systems don’t provide the level of power that the grid offers – you can’t run a large refrigerator or power tools on 50 Wp of PV – but they have huge potential to provide reliable access to electric lighting, communications and mobile money. System costs will continue to decrease as the global PV market continues to grow, and the improving efficiency of lights and appliances will provide increasingly better services.